This sandwich, a variation on the traditional BLT, draws its flavors from smoked bacon-flavored nutty tempeh and juicy tomatoes. Learn how to make Facon Bacon. Warm the tempeh bacon over medium heat in a dry sauté pan for about 2 minutes per side. Tear the tempeh bacon slices in half and set them aside. 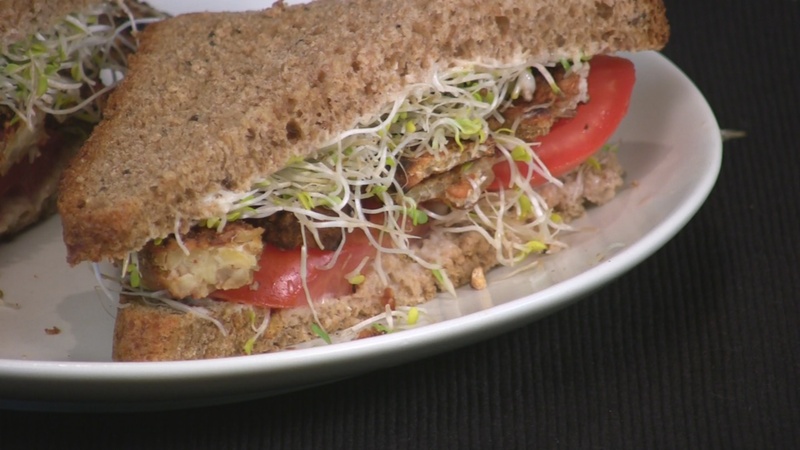 Place the tomato slices, then the tempeh bacon slices, and then the sprouts between slices of mayonnaised bread and press the sandwiches together. Making It Simple: Technically, the tempeh is already cooked before it gets packaged, so you can forgo cooking it in the pan. The flavor won’t be as deep, but it saves you a few minutes. The Gourmet Touch: Smoke the tempeh with hickory chips for about an hour before adding it to the sandwich. You can make a huge batch of tempeh like this and then store it in the refrigerator for a couple of weeks, using it in various recipes. 21-Day Weight Loss Kickstart by Neal Barnard, M.D.